We’ve said it before and we’ll say it again, Thanksgiving is easily one of the best days of the year. Family and friends aside, there are few times during the 364 other days of the year when eating three servings of marshmallow sweet potatoes and six scoops of stuffing is possible (or socially acceptable). But, as much as we love Turkey Day, it often leaves us feeling sluggish, sleepy and downright stuffed. Though we don’t suggest doing a straight up cleanse after the biggest food holiday of the year — because that’d be like going from 0 to 60 in three seconds flat — there are certain steps you can take to help you get on the road to recovery post-Turkey, and just in time to do some serious Black Friday shopping damage. 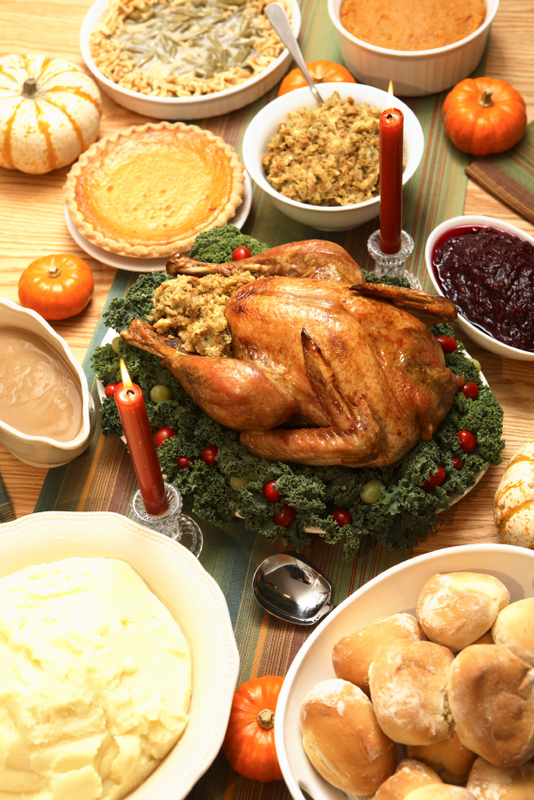 Below is the Thanksgiving dinner damage control plan that will get you right on track. Happy eating! Pile on the Protein: On Thanksgiving Day, feasting on primarily protein first will help to fill you up and your body will be better prepared to digest the carbs you’re going to throw at it. Pairing protein with carbohydrates will fill you up and give you energy, rather than simply fill you up if you were eating carbs alone. Hunt down the turkey, ham or any other meat on the table first to help your body better process the meal. Start Friday with Peppermint Tea with Lemon: Yes, peppermint tea makes the holidays feel that much closer, but it also helps to settle an upset stomach, while lemon kicks your metabolism into gear. Beginning the morning after Thanksgiving by settling your stomach while simultaneously getting it ready to eat again will help you ease into normalcy. Go for a Low Carb Breakfast: If you’re still pining after the apple pie come Friday morning, resist the urge to start the day with the dessert from the night before. Go for a high protein, low carb breakfast, like an egg white omelette with spinach or yogurt with almonds. It’s just as bad to not eat breakfast as it is to overstuff yourself, so a light, healthy breakfast will get you on track. Plan a Walk: Black Friday shopping is the perfect excuse to get yourself up and moving after Thanksgiving, but if you’re more into Cyber Monday, plan a walk on Friday afternoon. If you’re feeling really ambitious, you can head to the gym, but stick to simple, low impact exercises that won’t upset your stuffed stomach. Portion Out Leftovers: Half the fun of Thanksgiving is the week’s worth of leftovers that come after dinner, but putting yourself into a tryptophan coma two nights in a row can wreak havoc on your body. Take smaller serving sizes of your favorite dishes from the night before and eat on the earlier side (before 7 P.M.) to give your body time to digest.